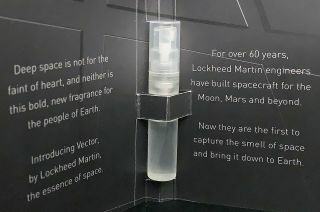 Lockheed Martin made their April Fools' Day joke real by bottling Vector, "the first ever fragrance to capture the aroma of space," based on the olfactory experience of astronauts. Lockheed Martin's April Fools' Day joke passed the smell test. The aerospace company on Monday (April 1) kicked off its prank by announcing a launch, but rather than it being of a rocket or a spacecraft, it was Vector, "the first ever fragrance to capture the aroma of space." And no sooner did the liftoff occur, than thousands of people came to Lockheed Martin's website to request a sample. One might expect that to be the gag, but the company went a step further, not only creating a spot-on ad for the bottled essence of space, but also producing the scent for real, as in actual vials of the unisex (if not also universal) eau de (zero-g) toilette. Related: What Does Space Smell Like? "We started thinking about the rollout of this campaign," said Alex Walker, the marketing lead for Lockheed Martin's space division, "and how much more engaging it would be to have an actual, physical fragrance sample to offer, right?" The smell of space might have remained a joke were it not for the experiences of astronauts like Tony Antonelli, who got a first-hand whiff of the final frontier on his missions as a space shuttle pilot and commander. "The first time I opened the hatch to help spacewalkers back inside, I was blown away by the strong and unique odor they brought back. I had smelled nothing like it before," said Antonelli, who now leads Orion spacecraft mission planning for Lockheed Martin and featured prominently in a parody "origin story" video for the Vector campaign. Antonelli's fellow space fliers have likened the scent to seared steak, gunpowder, welding fumes or mushroom soup. "Tony's story is that space has this sort of burning, almost metallic scent to it," said Walker. Walker and his team provided Antonelli's description to Scented Studio, a perfumery local to Lockheed Martin's offices in Denver, which then crafted three candidate scents. "We did a sniff test here in the office," said Walker, "and we selected scent number one, which I believe was called 'Warm Metal,' and that became Vector." In addition to the small supply of samples that is being sent out randomly to those who signed up on the Vector website, Lockheed Martin will also have 2,000 vials of the fragrance to give out to attendees at an upcoming annual space conference in Colorado Springs. "We always come up with some swag to hand out at Space Symposium and we thought Vector would make for a great giveaway," said Walker. The goal then and on April Fools', said Walker, is to get people thinking and talking about Lockheed Martin. "We're hard at work building spacecraft and we've been doing it for over 60 years. We thought this was a great way to remind people of that — and remind them that we're human," he said. "We have 18,000 people at Lockheed Martin Space and we come to work every day, roll up our sleeves and work hard for NASA, NOAA and the U. S. Air Force." "It's cool to connect the work that we're doing with the promise of what's waiting for us in the cosmos with a narrative like, 'Oh, Lockheed Martin's bottled the smell of space. That's really cool and interesting and I want to find out more about that,'" Walker said. And what about that smell of space? Did Lockheed Martin get the right scent? "I think we got pretty close," said Walker. "I mean, I've never been to space, but it smells good to me."